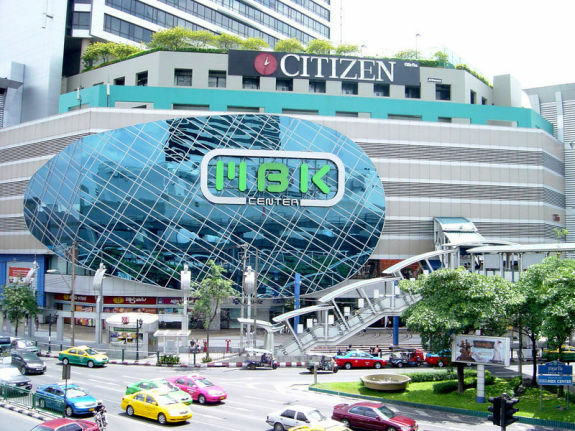 The MBK Centre in Bangkok is one of the city’s bargain shopping icons and most popular tourist attractions. Well located and easily accessible via public transport, 100,000 visitors flock to this shopping Mecca each day. Flights to Bangkok are cheaper than ever, and everything you save on cheap airline tickets will go far in the MBK, where there are countless bargains to be had. Known as Mahboonkrong to locals, the MBK Centre was opened in 1986 and has blossomed into the city’s premier bargain mall. Spanning 8 floors and containing over 2,000 shops, the mall is a spectacle all on its own. For those staying in or around Bangkok, the easiest way to reach the MBK is through Bangkok’s efficient public transport system. Tourists can go straight from their flights to the mall by transferring from the airport link to the air-conditioned BTS Skytrain to either Siam or National Stadium station, which are both within walking distance from the mall. The MBK Centre’s distinctive blue entrance makes it easy to spot from far away. The MBK Centre is a bargain hunter’s paradise. Despite its seemingly chaotic layout, the mall is organised rather well. Most shoppers focus their attention on the first 3 floors which are full of vendors selling clothes, shoes, accessories, jewellery and more. Products range from genuine brand name items to local goods. Many of the locally-made items can be purchased at a great value in the MBK Centre, including Thai silk scarves, ties and other pieces. Bargaining is an art form in Thailand, so tourists should feel free haggle for their purchases. Most of the employees who work in the mall speak a little bit of English, some even more than they let on, so there’s no need to worry about the language barrier. 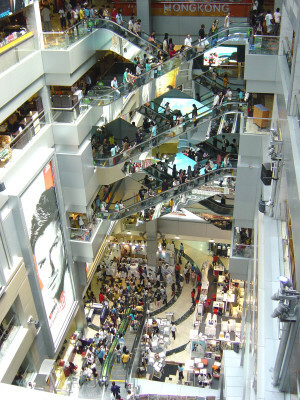 The mall’s 4th floor is full of electronics, mobile phones, software and other computer supplies. Mobile phone accessories, covers and other trinkets are especially popular with tourists here, as they tend to be a fraction of the cost at the MBK Centre compared to the stores back home. This is a great place to get your mobile phone (iPhone, etc) unlocked so you can use a cheap Thai SIM card during your holiday. It costs and $10-20 to get the phone unlocked and takes about one hour. On the 5th floor sits an excellent international food hall, which features cuisine from Italy, Thailand, China and more. There are also, a number of reputable spas and places to get a quick massage on this floor which provides a nice break from a hard day of shopping. Aside from eating and relaxing, tourists can peruse the furniture for sale on the 5th floor. While it’s typically not practical to take flights back home with a couch, there are smaller home accessories which might be of interest. The 6th floor contains even more dining options, while the top two floors are reserved for entertainment purposes. Tourists can try their hand at karaoke, or unwind in the bowling alley. The MBK Centre combines a tourist attraction with a shopping destination and cultural experience. There’s really no place quite like it in the world, and it is one of the must-see destinations in Bangkok, regardless of whether you are a big shopper or not. It provides tourists with an opportunity to interact with locals, get a great deal on any number of items, and will undoubtedly be an unforgettable experience. Thanks to its convenient location, there’s no reason not to pop into the MBK Centre, even if it’s just for a few hours, to see what it’s like.